There is a question that is rarely asked or addressed by any constituent of the American criminal justice system. This is not overly surprising, given the assembly line nature of the modern system. The meting out of justice takes place by rote, and the system is on autopilot. But with more than two million Americans currently incarcerated, it may be time to make a deceptively simply query whose answer could shed light on why the United States incarcerates its own citizens at such high rates: Why do we punish? And perhaps more importantly, What does the American theory of punishment say about the people of this country? 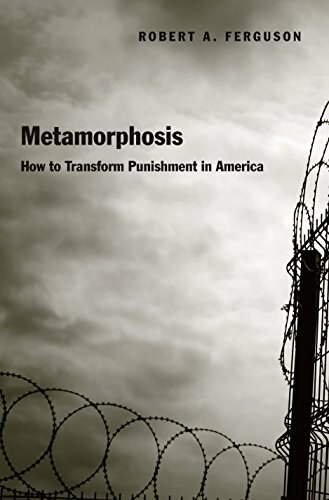 The late Robert A. Ferguson explores these issues and more in his posthumously published book, Metamorphosis: How to Transform Punishment in America. Ferguson, who was the Professor Emeritus in Law, Literature, and Criticism at Columbia Law School, employs his substantial knowledge of law and philosophy in order to argue that the American theory of punishment has led to an epic failure of the criminal justice system. Ferguson makes a compelling case that corrections is sorely in need of correction, and that the cruel, but sadly usual nature of American punishment needs rehabilitation. Metamorphosis is an apt title for this intellectually profound book. Theories of punishment and corrections are, in their pure form, grounded in the concept of metamorphosis. The idea is that punishment will force a transgressor to adjust his behavior, ideally in a positive manner. Change, argues Ferguson, is "the touch stone in punishment." But the transformation that prisoners experience as the result of punishment depends entirely on the theory behind punishment. In America, the central theory has long been retributive. A strong emphasis on just deserts and getting the pound of flesh has led to a criminal justice and punishment system in which cruelty and dehumanization are the norm. What kind of change will result from such a system? Nothing that resembles rehabilitation. The problems in our punishment system are endemic, and as Ferguson shows, extend all the way into the very language used in criminal justice and prison systems. As a nation, we don't address the problems that lead to crime, we declare "war" on crime. We declare war on drugs. That language, argues Ferguson, matters. "[D]eclaring 'war' has murderous implications," writes Ferguson. "It isolates a common enemy for destruction. Mere transgressors become foes to be eliminated. In war, galvanized hatred replaces concern, and desire for a solution insists on total victory. The patriotism invoked confuses more than it clarifies when it comes to crime. A search for 'the enemy within' replaces normal communal sensibilities. Attacking the enemy calls for putting erring citizens behind bars permanently, and it asks that thoughts of citizenship be ignored for those who are caught and incarcerated. Mass incarceration has been one of many negative results." Ferguson devotes one chapter to another unanswered question: What is punishment for? More specifically, do we use prison for punishment, or do we send people to prison as punishment? Ferguson argues that this question is not answered, and as a result overcrowding, harsh prison conditions, overbearing surveillance, wanton violence and willful disregard of the humanity of prisoners results. It may be that Americans think that individuals are sent to prison for punishment, but the current state of the carceral system strongly suggests otherwise. Whatever the answer to the question, one thing is certain: the use of the term corrections to describe what is happening in American prisons is a travesty. There is no correcting happening. Ferguson argues that corrections is a term "without real meaning in American punishment regimes today" and suggests that real attempts at proper, institutionalized correction of aberrant behavior have not even been tried in this country. In short, the American punishment regime does not provide the conditions necessary for the rehabilitation, restoration, and metamorphosis of an individual who has violated the law. As such, Ferguson suggests that the system itself is in need of reform, a metamorphosis of its own. He outlines several ways in which we may ameliorate the punitive nature of our punishment system. Precise and purposeful use of language is number one on this list. For instance, we use the term prisoner to describe the punished. The etymology of the word reveals that it arose to describe a person taken in war and held as a captive—a prise, or prize. Ferguson wonders how different punishment might be if incarceration was instead thought of in the stoic sense of prokopē, which means "a place of progress." If instead of referring to the incarcerated individual as a prize of the state, he was designated ho prokopton—one who is in a state of progress—might we think differently about what goes on in a prison? Ferguson believes the answer is yes, and evidence that the language of punishment matters. Several other practical suggestions are made. Judges should involve themselves more in the corrections process. Prison guards should be professionalized—the two months of basic training that makes a guard should be modified to the two years of professional training that makes a correctional officer. Educational opportunities for the incarcerated should be greatly increased. Prisons should be made more comfortable. Some of these ideas are antithetical to the idea of punishment in America. That, however, is exactly the point. Our punishment system does not work, and a metamorphosis to one that does is what is needed.